Palo Alto-based Lumo BodyTech is revealing its second product today, the Lumo Lift. The Lift, like its original Lumo Back, is a device designed to enhance a user’s posture, but with a radically different take. The Lift is small and stylish, and is designed to be placed unobtrusively on the collar or shoulder. The upper body Lift detects curvature at the top of the spine, rather than at the bottom like the original Lumo Back, but co-founder and CEO Monisha Perkash explained in an interview that the end result is mostly the same. Adjusting based on improper posture at the top of the spine ultimately straightens the entire skeletal system. With the Lift, when your spine curves, you get a small buzz that provides a gentle physical reminder to straighten up. And the Lumo Lift goes beyond just posture correction – it can also track and detect movement, and physical activity including steps and calories, just like the Fitbit and other gadgets. The ability to detect and analyze core body positioning is unique to the Lumo Lift, however, and Perkash says that its algorithm and software for discerning that information is the key ingredient to Lumo BodyTech’s long-term prospects for success. The clasp on the Lumo Lift is magnetic, with the sensor going underneath the shirt, and just a small square metal clasp showing over top. I suggested there might be an opportunity for Lumo to create new accessory clasps to work with the Lift, and Perkash confirmed that was indeed the plan, with accessories likely rolling out down the road. Lumo will continue to sell the Lumo Back, too, and says that they’re aimed at slightly different customer segments. The Lumo Back is still designed to help people who want more from their posture sensor, and who are stationary at a desk for longer periods of time. The Lumo Lift is much more compatible without someone who moves around more during the day, and it’s a lot less cumbersome. 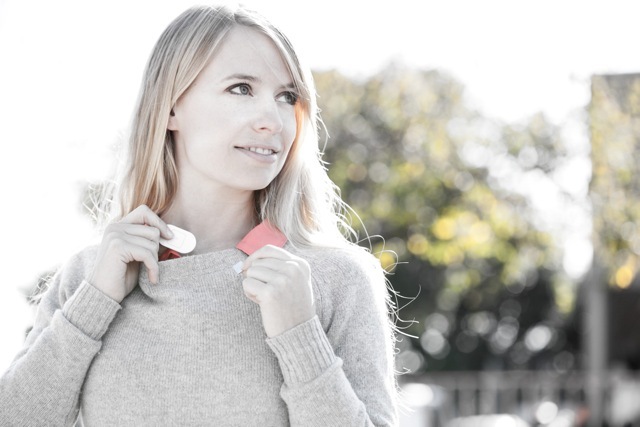 Eventually, Perkash says she envisions Lumo BodyTech pushing into many different form factors, including eventually ones that integrated completely into clothing and other accessories. Currently, Lumo is also working on a sport specific sensor designed to leverage what it has learned about posture and body positioning, which Perkash says we’ll see later this year. The Lumo Lift is being crowdfunded by Lumo itself, and should ship in late spring 2014, with early backer pricing ranging from $59 to $79, with a companion app to be released for iOS initially.